This is one of those great finds that you sometimes run across when searching through older books. This was such a cute book. Serena's new friends tend to use her skill of lip-reading to dig up dirt and information. 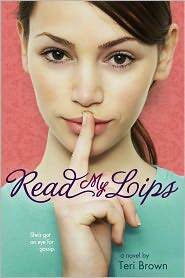 She is deaf, but rather than learn sign language, she instead learned how to lip-read extremely well, where she can read what someone is saying from across a large room even. Her unique talent in this caused some rather funny scenarios that had me grinning and laughing. Although there were funny scenarios, Serena also learns some not so nice things that make her feel guilty for spreading the information to her eager buddies. This relationship between herself and her friends complicates her relationship with the guy she likes, Miller. I loved the growing relationship between Serena and Miller. It was a cute romance. Additionally, I loved how neither Miller, or anyone else seemed to make too big of a deal about Serena's disability. It was refreshing. I would highly recommend this book if you are looking for a fun, lighthearted read that will lift your spirits and make you happy. I've never been one for contemporary, but I think I should start.